Celebrities are THE fashion icons for beauty, makeup — and of course, hairstyles. Kerry Washington is no exception. That’s why we’ve got Kerry Washington photo galleries, pictures, and general beauty news on this celeb. Her style is totally inspiring and worth checking out. So if you’re searching for some beauty tips, hairstyle options, and fashion advice, turn to Kerry Washington. She’ll bring your fashion to a whole new place. 1. To get Kerry Washington’s hairstyle, start with second-day hair. Spray your hair with a salt spray. 2. Gather your hair into a high bun and secure it with bobby pins. 4. Loosen any tight pieces of hair near your scalp. 5.Finish with a medium-hold hairspray. 1. To get Kerry Washington's hairstyle, apply a texturizing cream to damp hair then blow dry straight using a round brush or comb attachment. Blow out your bangs with a fine-toothed comb as necessary. 2. Once your hair is try, mist a heat protecting spray throughout all of your hair. Then begin using a flat iron to wave sections of your hair, starting from the back. 3. Clamp your hair close to the roots, then nod your wrist up and down as you slide the iron down the length of your hair. The less you wave your wrist, the looser the waves will be. 4. Once all of your hair is done, rake through your waves using a wide-toothed comb. 5. Mist a shine serum throughout, then finish with a workable hairspray. 1. To get Kerry Washington's hairstyle, create a side part and apply a shine serum throughout all of your hair while damp. Blow dry your hair with a round brush. 2. Wrap 1-inch sections of your hair around a 1-inch curling iron and curl away from your face. 3. Tuck the side of your hair opposite your part behind your ear and secure with a bobby pin. 1. 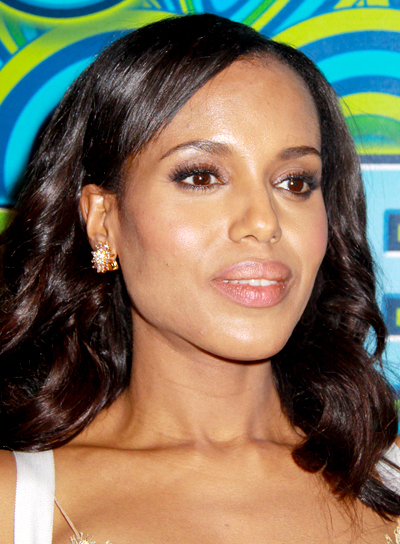 To get Kerry Washington’s hairstyle, apply a shine serum to damp hair and blow dry. Use a small round brush to add curl, and then part your hair in the center. 2. Spray your hair with a shine spray. 1. To get Kerry Washington's hairstyle, apply a heat protectant to damp hair and blow dry straight using a paddle brush. 2. Pull your hair back into a tight high ponytail and secure with an elastic. 3.Apply a quarter size amount of mousse and use your hands to smooth down any flyaways. 4. Fan out your ponytail and loop the ends back under toward the elastic. Use bobby pins to secure the ends to create a wide bun. 1. To get Kerry Washington's hairstyle, mist a heat protectant spray all over the length of your hair. 2. Next, create a center part, then use a flat iron to curl 1-inch sections of your hair randomly. Make sure to wave sections away from your face for a natural look. 3. Divide you hair into two sections on either side of your head. Then rake each section back and twist it down to the nape of your neck. Secure loose pieces with bobby pins. 4. Finish by misting your hair all over with a strong-hold hairspray. 1. To get Kerry Washington's hairstyle, mist a generous amount of heat protectant spray onto straight hair. 2. Begin curling 1-inch sections of your hair using a curling iron. Start close to your roots then curl down the length of your hair. 3. Once all of your hair is curled, rake through with your fingers. Then rub a styling pomade onto the palms of your hands and run your hands over the top and sides of your hair. Use a soft bristle brush to smooth and distribute the product evenly. 4. Pull the sides of your hair back and pin them down using bobby pins. 1. To get Kerry Washington's hairstyle, apply a heat protectant to damp hair and blow dry on medium heat, using your fingers to add texture and wave. Use a barrel brush to create volume at the roots. 2. Use a styling wand to curl sections of your hair at random. Then, rake through your curls immediately after to create soft, gentle waves that aren't too structured. 3. Create a side part and then divide your hair in half from ear to ear. Smooth the top portion back and secure with a bobby pins at the back of your crown. 4. Spray your hair with a shine serum, and then run your fingers through your hair to give it a more lived-in feel. 1. To get Kerry Washington's hairstyle, apply smoothing cream to your damp hair and blow dry straight under low heat using a round brush. 2. Once your hair is completely dry, use a 2-inch curling iron to curl just the ends of your hair. 3. Mist your hairstyle with shine spray to add a gorgeous sheen. 1. 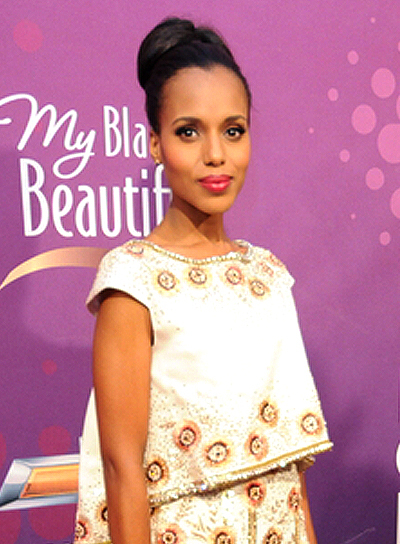 To get Kerry Washington's hairstyle, apply a texturizing mousse to damp hair and blow dry straight. 2. Next, loosely wrap random sections of your hair around a styling wand. Use a wide-toothed comb to rake through each layer of waves as you go. 3. Run a flat iron over your bangs to smooth them out, then spritz your hair all over with shine serum. 4. Finish by misting with hairspray. 1. To get Kerry Washington's hairstyle, apply a texturizing balm to damp hair and blow dry evenly with a round brush. 2. Create a center part and smooth down your hair with a light shine serum. 3. Then, begin to curl the bottom half of your hair in 2-inch sections using a large barrel curling iron. 6. Brush through your curls to soften and finish with a light hold hair spray. 1. To get Kerry Washington's hairstyle, start with unwashed hair for the most texture. 2. Use a teasing comb to tease the top layer of your hair, focusing near your hairline and crown. 3. Once you've reached the desired height, use your fingers to loosely gather all of your hair back into a bun. Secure it with an elastic. 4. Tug at the top of your head to loosen the updo, and mist all over with strong-hold hairspray to keep your look in place. 1. To get Kerry Washington's hairstyle, apply a texturizing moisturizer to damp hair, then blow dry straight using a round brush or comb attachment. 2. Once your hair is dry, mist a heat protectant spray throughout your hair, then use a flat iron to smooth hair out evenly. Be sure to straighten your bangs naturally and sweep them over to one side. 3. Next, begin wrapping 1 to 2-inch sections of your hair around a small barrel styling wand. Start from the back about three inches away from your roots, then work your way through to the ends. 4. Once all of your hair is curled, use your fingers to pull the curls apart gently. 5. Spritz shine serum over your hair then finish with a flexible-hold hairspray. 1. To get Kerry Washington’s hairstyle, apply a curl defining cream to damp hair and blow dry with a diffuser, using your fingers to fluff up the curls. 2. Part your hair slightly off to the side, and use a round brush to blow dry bangs straight and smooth to the side. 2. Spray your hair with a heat protection spray, than use a 1-inch curling iron to curl hair from the top, alternating directions for a more natural look. 3. Finish with an anti-humidity hairspray.